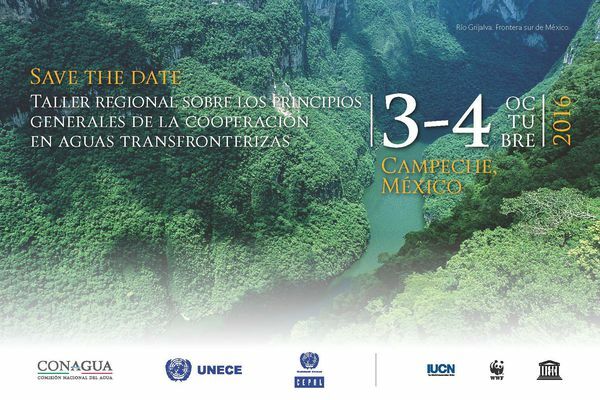 The workshop was jointly organized by the UNECE and the National Water Commission of Mexico (CONAGUA), in partnership with the Ministry of Environment and Natural Resources of Mexico (SEMARNAT), the United Nations Economic Commission for Latin America and the Caribbean (ECLAC), the Ibero-American Water Directors Conference (CODIA), the International Union for Conservation of Nature (IUCN), and the World Wide Fund for Nature (WWF). It was supported by the Swiss Agency for Development and Cooperation (SDC) and other donors. It was organized as a follow-up of the workshop “Latin American and Pan-European Regions: Sharing Experiences and Learning from Each Other”, which took place in June 2013 in Buenos Aires, Argentina. The workshop provided an in-depth analysis of the principles of transboundary water cooperation through examination of relevant good practices and instruments. Participants discussed in particular the benefits and challenges associated with international legal instruments such as the UNECE Convention on the Protection and Use of Transboundary Watercourses and International Lakes (Water Convention) and the United Nations Convention on the Law of the Non-Navigational Uses of International Watercourses (Watercourses Convention). During the workshop, concrete experiences from bilateral and multilateral cooperation on transboundary water were illustrated. The workshop also provided an opportunity to discuss the legal and institutional aspects of transboundary water cooperation, that builds trust for cooperation by assessing its benefits, data exchange and adaptation to climate variability and change. A short article by UNECE regarding the workshop can be found here. International Water Law: the policy / political dimensions: sense or no(n)-sense?